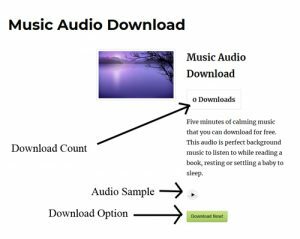 Using the Simple Download Monitor Plugin and the Compact WP Audio Player Plugin you can easily offer an mp3 file for download alongside an audio preview. A good example of this practice is an iTunes song that can be sampled before you go ahead and purchase it. Both plugins required to configure an audio download and offer a preview are free and can be used on any WordPress website. These two plugins allow you the flexibility to offer your customers multiple downloadable items, each with an audio preview. Providing a sample audio gives your customers an idea of what the download includes. Ensure you have installed and activated the Simple Download Monitor Plugin and the Compact WP Audio Player Plugin. Step 1) Click on the ‘Downloads‘ menu in your WP dashboard and then on ‘Add New‘. This will allow you to create a new download. Step 2) Give your download a ‘title‘ and a ‘description‘. Replace the “URL-OF-THE-MP3-FILE” with the audio file you will be offering your customers. This shortcode will display a simple play/pause button that will allow your customers to listen to the audio. For the full list of fancy shortcodes visit the Audio/Music Player Plugin Page. Step 4) Upload the file your customers will be able to download by clicking the ‘Select File‘ button. Step 5) Select a file thumbnail (if applicable). Step 6) ‘Publish‘ your audio download. Your customers will now be able to sample the audio before they decide they would like to download it. You will be able to view the download log and statistics as per usual. 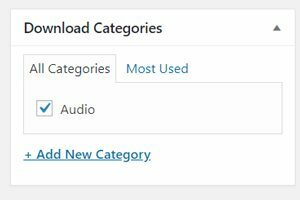 When you create your downloads it is good to give each of them a category. This allows you to then display downloadable items with similarities, quickly and easily on any WordPress post or page. For example, I have three downloadable audio files. I have categorized each of these as ‘Audio’. I would now like to put all of my audio files on one page so that my customers can choose which one they would like to download. Step 1) Ensure all downloads with similar qualities are marked under the same category. 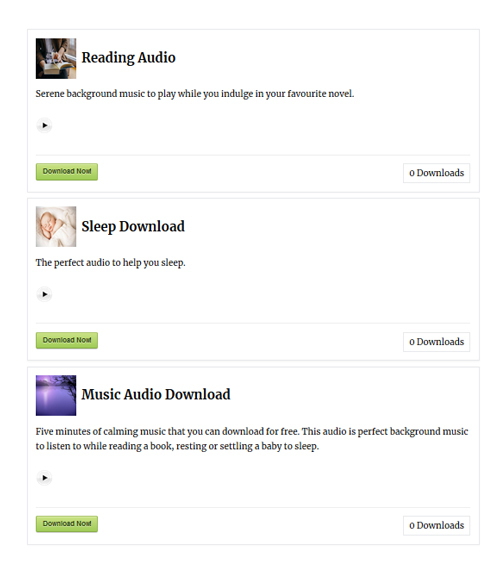 Step 2) Create a post/page where you would like to display your audio downloads. Replace the “test-dowload-category” with the title of the category you would like to display. Step 4) Publish the post/page. Note: You can sort the download item display of a category using different shortcodes.